SOUL FOOD for Hungry Adult Communities: July 21, 2013: 16th Sunday in Ordinary Time. SIXTEENTH SUNDAY IN ORDINARY TIME: JULY 21, 2013. YEAR OF ST. LUKE. Mass Readings for this Sunday: GOSPEL: LUKE 10:38-42. First Reading is from Genesis 18:1-10. Second Reading is from Colossians 1:24-28. Click here for Mass Readings, or find them in your own Bible or Sunday Missal. A warm welcome is always good to get,- when you know that your arrival brings joy to the home you are visiting. There’s a warmth, an embrace, a kiss of welcome. Maybe even a bear-hug! Well, today’s readings are all about welcome, about receiving guests into your home and into your life. There’s Jesus, welcomed into the home of Lazarus and Martha and Mary. It was his favourite house, his hide-away, when he was in or near Jerusalem. They loved him, and he loved them. ‘See how he loved him’ said the neighbours when they saw Jesus weeping, near the grave of Lazarus, later on. ‘Jesus wept’,- the shortest sentence in the Bible. But that was later. And what about Abraham, and his Guests? ‘The LORD appeared to Abraham at the oak of Mamre’, while Abe was sitting at the entrance to the tent in the hottest time of the day. ‘He looked up and saw three men standing near him.’ These three men are three messengers (‘angels’) from God,- God appears to Abraham in the guise of these three strangers. And Abraham makes a big fuss in welcoming them,- or rather, he hurries to Sarah, his wife, and gets her to do all the work of preparation, while he takes care of his guest(s). They get the ‘full Irish breakfast’ (Jewish, in this case!) treatment, -nothing spared. And Abraham knows that it is the LORD who has in fact appeared to him. ‘The Hospitality of Abraham’ by Andrei Rublev: Andrei Rublev, a Russian, wrote the Icon of the Trinity, as it is now called, or more correctly ‘The Hospitality of Abraham’,- depicting the three angels at the table of Abraham, with the oak of Mamre in the background. 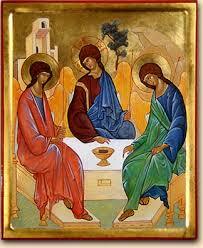 The icon of the Trinity was painted around 1410 by Andrei Rublev (known as St. Andrei Rublev). Andrei Rublev was born circa 1360. He died on January 29, 1430 and is buried at the Andronikov Monastery in Moscow . The image is full of symbolism – designed to take the viewer into the Mystery of the Trinity. An icon is not a painting in the sense we normally regard pieces of art, although it is an image that is painted. An icon is a window out of the obvious realities of everyday life into the realm of God. Every paint-stroke has a meaning hallowed by centuries of prayer. Icons are religious images that hover between two worlds, putting into colors and shapes what cannot be grasped by the intellect. Rendering the invisible visible. Icons are the visual equivalents of the Divine Scriptures. Not every religious painting can be considered an icon. Icons are religious pictures that convey inner spiritual meaning of their subject matter. The Son of God came to restore the divine image in human form. Iconography is the graphic witness to this restoration. This icon takes as its subject the mysterious story where Abraham receives three visitors as he camps by the oak of Mamre. He serves them a meal. As the conversation progresses he seems to be talking straight to God, as if these ‘angels’ were in some way a metaphor for the three persons of the Trinity. In Rublev’s representation of the scene, the three gold-winged figures are seated around a white table on which a golden, chalice-like bowl contains a roasted lamb. In the background of the picture, a house can be seen at the top left and a tree in the center. Less distinctly, a rocky hill lies in the upper right corner. The composition is a great circle around the table, focusing the attention on the chalice-bowl at the center, which reminds the viewer inescapably of an altar at Communion. On one level this picture shows three angels seated under Abraham’s tree, but on another it is a visual expression of what the Trinity means, what is the nature of God, and how we approach him. Reading the picture from left to right, we see the Father, the Son, and the Holy Spirit. They are seated around a table. The tree of Life is in the background. We see the bowl in the centre, and the hand of Christ reaching towards it,- the dish of the Eucharist. There is an opening at the front, inviting all God’s people to enter in and be part of this table of the Trinity, this communion of the Trinity. ← SOUL FOOD for Young Adult Communities: July 21 2013, Sixteenth Sunday in Ordinary Time.